How Russia hacked American voters. 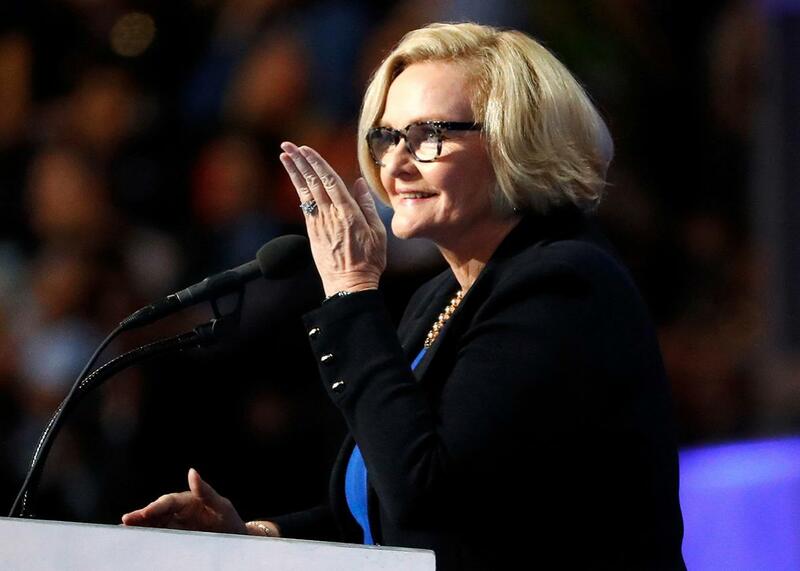 Sen. Claire McCaskill delivers remarks on the fourth day of the Democratic National Convention at the Wells Fargo Center, July 28, 2016 in Philadelphia, Pennsylvania. For months now, there’s been a blur of speculation and information suggesting Russia was interfering in our presidential election. Early on, officials in the Obama administration figured that the objective was simply to undermine faith and confidence in the electoral process. But over the weekend, a new CIA assessment brought it all into focus: Russia turned to cyberspace to help Donald Trump win the election. But Russia’s cyberventionism—its apparent proclivity for conducting interventionism via cyberspace—didn’t take the form of an attack we’d typically expect to see. There were no denial-of-service attacks on state election systems or website defacements like it conducted against Estonian and Georgian governments and political parties in 2007 and 2008, respectively. And despite a number of pre-election reports citing voting-machine vulnerabilities, anyone going in search of hacked precinct electoral computers is likely to come up empty-handed. So how exactly did Russia hack the election? Well, it didn’t. It hacked us—the voters. Why screw around with inefficient, resource-intensive brute force hacks on voting machines to flip ballots when you can simply convince voters to do it for you? In other words, by targeting voters’ decision-making processes instead of the machines that record their decisions, Russia could influence the election without breaking into a single electoral computer. This isn’t new thinking. Hackers learned long ago that the most efficient way to break into a computer wasn’t to try to outsmart firewalls and other network security measures. It’s far easier to trick users into giving up their credentials or unknowingly installing malware. Computer engineering turned to good old-fashioned social engineering, in the form of phishing. (As you probably know, phishing is when a hacker tries to dupe a user into giving up personal information or credentials that can be used to compromise computers and networks.) And it worked. Allan Paller, the director of research at the SANS Institute, estimated in 2013 that 95 percent of all successful cyberattacks on enterprise networks are the result of phishing, and cybersecurity firm FireEye found in a report issued this year that phishing is the most prevalent delivery method for advanced persistent threats. In cybersecurity circles, this is a well-known dilemma. So much so that network problems are often traced to a phenomenon called PEBCAK, or “Problem Exists Between Chair and Keyboard”—that is, a user. Russia aimed between the campaign and the ballot box, and it targeted voters. No one familiar with Russian operations is particularly surprised by this approach. It’s called information warfare, and its goal is to employ disinformation to manipulate a target population into making choices it might not otherwise make. I spent two decades as an information-warfare officer in the United States Navy, and it’s common knowledge in military and intelligence circles that deception, propaganda, and psychological operations are hallmarks of Russian doctrine. So on Sunday when Sen. Claire McCaskill called Russia’s intervention in the election “a form of warfare,” this is exactly what she meant. How’d they do it? Basically, by doxxing the Democrats and unleashing fake news. Russia was behind the stories that dominated our headlines, both real and fabricated, for several weeks leading up to the election. In doing so, it bet that casting further doubt on Clinton’s honesty and character while also polluting the information environment with false stories would affect the decisions of enough voters to increase Trump’s chances. It wagered that in a close election, perhaps it could be the difference. We now know that two Russian intelligence groups hacked into the Democratic National Committee’s email server in the spring and, over time, stole tens of thousands of emails and documents. Then in July, just before the start of the Democratic National Convention, WikiLeaks released nearly 30,000 of them, revealing the DNC’s inner workings, private conversations between staffers, and campaign tactics. In October, it made publicly available the text of some of Hillary Clinton’s high-paid speeches to Wall Street, which she’d refused to discuss at length. Shortly thereafter, nearly a full month before the election, the Clinton campaign accused WikiLeaks of being “nothing but a propaganda arm of the Kremlin with a political agenda doing Putin’s dirty work to help elect Donald Trump.” Welp. These leaks seemed to further the narrative that Clinton was untrustworthy, disingenuous, unfairly favored, and allowed to play by a different set of rules. They also fueled the heat she took for separate issues, like classified emails on her private server or questions about the Clinton Foundation, which only added to the sense that she wasn’t being straight with the American people. This perception of her contributed to strikingly high unfavorability ratings and helps explain why nearly half of registered voters who supported Trump proclaimed that they were actually voting against Clinton. Then there was the fake news. These fabricated stories ranged from purported admissions that Clinton was paying people $3,500 to protest at Trump rallies to a supposed declaration by the pope that he supported Donald Trump. These stories questioned Clinton’s health, reported a murder-suicide of an FBI agent involved in the Clinton email leaks, and placed a Trump-Pence campaign sign in the yard of FBI Director James Comey. Reporting has shown that Russian propaganda is likely behind the intentional spread of such stories, even when it wasn’t the originator. These stories showed up at the top of search engine results and were shared on social media sites, which have increasingly become echo chambers for our personal politics. Trump campaign officials amplified some of these stories on social media, and even traditional media outlets were fooled on occasion. Analysis since the election has shown that fake news stories outperformed real news by the end of the campaign, and most Americans, but especially Trump voters, tended to believe the fake stories to be true. Russia set out to intentionally manipulate the information that voters consumed in order to influence the decisions they made on Election Day. The goal wasn’t to change the minds of the entire populace, but seed just enough doubt in the minds of undecided and tentatively committed voters to improve Trump’s chances. Just like the phishing email that appears to be an update on the status of the Christmas gifts you ordered or warning that there’s a problem with your tax return, disinformation only has to deceive a very small percentage of the right people to be successful. We will never know if Russia’s prolonged hackathon of American citizens definitively changed the outcome of the election. But what is certain is that the ballots cast by Americans—not Russian malware—gave Trump enough electoral votes to win the election. And voters did not make those choices in a vacuum. The media coverage of the doxxed DNC emails and the proliferation of fake news stories changed the information we considered when making our electoral choices. That is the art of information warfare. It is misdirection. We were all on alert for how Russia could hack election systems. And while we reeled in that red herring, Russia phished the voting public.